We are downsizing and return back to our faithful shed in Kilburn behind Brent Private Tenants’ Rights Centre (Advice4Renters). 36-38 Willesden Lane NW6 7ST, Cycle Shed entrance in Streatley Rd. Email info@cycletastic.org.uk . Please check the Cycletastic face book page to find out if we are open. Shed reopening : Saturdays only 12-4pm from 16th July 2016 …until it gets too cold ! Follow us,“Cycletastic” on Facebook for news and updates. Subscribe to our webpages (use links from our homepage). Cycletastic Pop-Up Shop All Summer Long! Our Mechanics Haroon and Richard are on hand to repair your bike and offer local cycling advise. Or why not have a search through our reconditioned bikes that have been donated by local residents and reclaimed through police channels. If you have the time we’ll take you through the basics of how to repair your bike while you wait. We also have New and Used parts and accessories for sale at bargain prices. We also have a series of workshops available for you to book in an learn how to look after your bicycle. For more details get in touch from the contacts page. Read on below for our previous and most current blog posts. Posted in Announcements, News, Workshops	| Tagged Fix, Repairs, Shop	| Comments Off on Cycletastic Pop-Up Shop All Summer Long! The Cycletastic Shed on Streatley Road is now open from 1.30 -4.30 each Saturday in 2018. Please check the Cycletastic Facebook Page for short notice updates. We will continue to open until the winter weather sets in again. The shed is there to help visitors learn how to keep their bikes running smoothly . Simple things such as how to maintain the correct tyre pressure for your bike, how to check and adjust your brakes, how to make the chain run smoothly without over oiling it….everything to help you enjoy the rides you make on your bike. The Cycletastic tool resource is there for your use to help you learn new bike fixing skills. Volunteers will help you. For those that can afford to pay there is a £5 minimum donation for using tools if you want to DIY fix your own bike at the Cycletastic shed. If you donate more we can then help people on low income or on benefits with free parts such as brake blocks and cables. If you ask a Cycletastic mechanic to do work on your behalf we will ask for payment for this work but we aim to keep prices lower than bike shop rates. Bike repairs can also be booked in for work which is completed outside shed opening times. 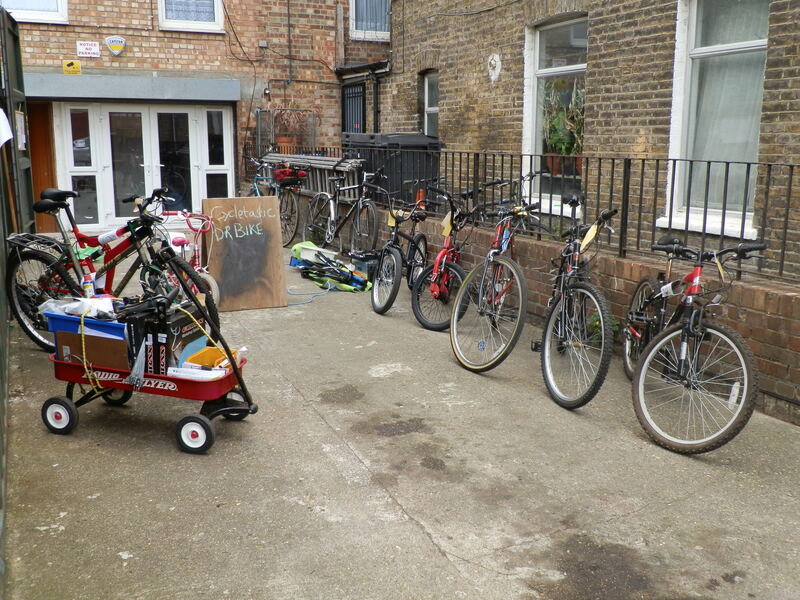 Second hand and new parts are available and there are children and second hand bikes for sale £20-150. New Volunteers are always welcome to join us (the existing volunteers). Volunteers can use tools for free and have access to low cost parts for their own bikes. Its sociable and you get to build your bike fixing skills and knowledge. Cycletastic also helps visitors find information about free cycle training in Brent and other boroughs to improve your bike riding confidence on the road. Route planning information is also available with any of the friendly helpful volunteer mechanics.